Energetically, this is a busy week beginning Monday and Tuesday with “Surrender and Release,” which is in perfect alignment with Tuesday’s Full Moon. 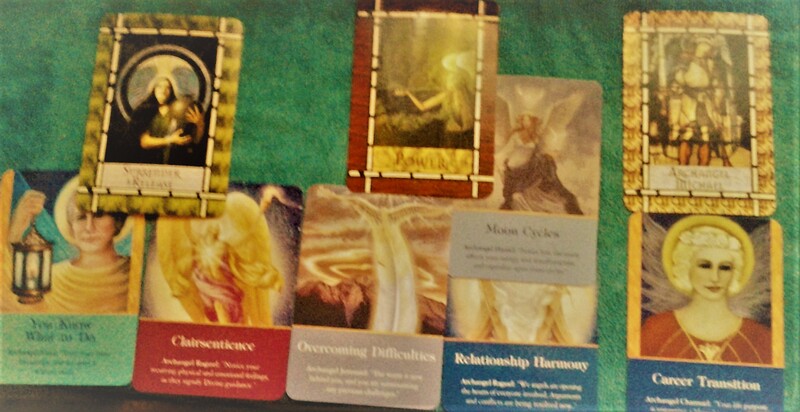 The archangels would like us to pay particular attention to our intuition and specifically our clairsentient abilities. Trust yourself. Archangel Uriel reminds you to trust your instincts and allow any recurring feelings and emotions be a guide to your intuition. Maybe you’ve been hanging on to something that no longer serves you. Take advantage of the full moon and Archangel Michael’s help to release something that no longer serves you. The middle of the week, tap into your own empowerment, realizing that no matter what is going on around you, you can stay centered. Know you are exactly where you need to be at this specific moment. Wednesday, take a deep breath and feel the lifting of some obstacle or difficulty. A sensitive or relationship conflict can easily be resolved now and places you once again into that peaceful, loving, and supportive space. This weekend reveals some opportunities around work, life purpose, or creative endeavors. You are worthy, as well as “eligible” for every good opportunity coming your way. My sense is that this is the time to start planning and gathering information for the New Year. Pay attention to messages this weekend that seem to come out of the blue. Archangel Michael is reminding us that we are always guided, guarded and protected. And, this is “Divine Order” month with Archangel Raguel, don’t let any chaotic energy unravel you. Full Moon, Tuesday, December 13th at 5:06 p.m. Mountain Standard Time. Be looking for the “Full Moon Update” from Lena Stevens and Pat Liles at the Power Path sometime tomorrow. As always, I’m sending you good vibes. CAROLAN DICKINSON is a psychic medium, angel communicator, teacher, and author of the book, Walking with the Archangels (Amazon, 2016). Her essay, “The Magic of Healing with the Archangels,” is featured in the anthology, Spiritual Leaders Top Picks (Visionary Insight Press 2017). Her first love is helping people learn to connect and build a relationship with the Archangels. She teaches classes and workshops on Archangels, Angel Card Reading, Intuitive Development, and Mediumship. When she’s not writing, or teaching a class, she devotes her time doing psychic medium/angel readings, or walking and talking with the archangels.